Trump said it's possible they will use next week's meeting to sign an agreement to end the conflict. The 1950-53 Korean War ended in an armistice, leaving the two sides technically at war. "As you know, that would be a first step. It's what happens after the agreement that really is the big point," he said. "Normalizing relations is something that I would expect to do, I would hope to do, when everything is complete." Trump earlier expressed confidence that he is ready for the summit. "The summit is all ready to go," he said at the top of his meeting with Abe, adding that both sides have been preparing for a long time. "I think I'm very well prepared. I don't think I have to prepare very much," he said. "It's about attitude. It's about willingness to get things done ... So this isn't a question of preparation; it's a question of whether or not people want it to happen, and we'll know that very quickly." Trump and Kim are slated to meet at the Capella Hotel on Sentosa Island at 9 a.m. Tuesday. The president said it will be more than just a photo-op and could be followed by additional meetings. "I think it's not a one-meeting deal. It would be wonderful if it were," he said. "They have to denuke. If they don't denuclearize, that will not be acceptable." The summit comes after Trump and Kim exchanged threats and personal insults last year over Pyongyang's testing of nuclear weapons and ballistic missiles capable of reaching the continental US. 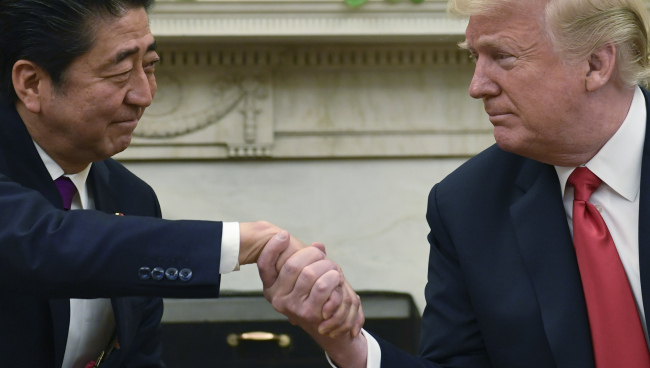 Abe has been pushing Trump to also address Japan's concerns about North Korea's short- and medium-range ballistic missiles and the issue of Japanese citizens abducted by Pyongyang decades ago. Tokyo is also a strong advocate of the international sanctions regime against Pyongyang. "We cannot take sanctions off," Trump said. "I could add a lot more, but I've chosen not to do that at this time, but that may happen." He later added at the press conference that the term "maximum pressure," which his administration has used to describe the US-led sanctions campaign, could be revived if the summit doesn't go well. "We don't use the term anymore because we're going into a friendly negotiation," Trump said. "If you hear me saying we're going to use 'maximum pressure,' you'll know the negotiation did not do well, frankly." US Secretary of State Mike Pompeo called on Kim to make the "bold" decision necessary to bring security and prosperity to his country. "He understands that we can't do it the way we've done it before -- that this has to be big and bold, and we have to agree to making major changes," the top US diplomat told reporters at the White House. "I'm hopeful that Chairman Kim Jong-un is prepared to make that decision for his country. A big shift in his strategic understanding of his security." Pompeo has led preparations for what will be the first US-North Korea summit, including through two meetings with Kim in Pyongyang. He again conveyed the North Korean leader's stated willingness to denuclearize. And he said the two sides have narrowed their differences on what denuclearization means but refused to elaborate. The US wants to see the complete, verifiable and irreversible dismantlement of the North's weapons of mass destruction programs. Pyongyang's definition has included the removal of "hostile" US policy, including Washington's military presence in the region and the nuclear umbrella over Seoul and Tokyo. Pompeo voiced hope for a lasting agreement that is unlike previous deals with North Korea. "We're hoping to submit a document that Congress would also have a say in -- that would give currency and strength and elongation to the process, so that when administrations do change, as they inevitably do, and this one will -- 6 1/2 years from now -- when that takes place, that Chairman Kim will have comfort that American policy will continue down the same path," he said. Pompeo said he will travel to Seoul on Wednesday after accompanying Trump to Singapore to discuss the results of the summit in a three-way meeting with South Korean Foreign Minister Kang Kyung-wha and Japanese Foreign Minister Taro Kono.